One of the four recalled pizza varieties. People will eat just about anything on a piece of flattened bread and call it a pizza, but most of us draw the line at small plastic fragments. That’s why the Nestlé Pizza Company has issued a recall for some frozen pizzas made under the DiGiorno and California Pizza Kitchen labels. California Pizza Kitchen© Limited Edition Grilled Chicken with Cabernet Sauce, UPC 71921 00781; production code is 3059525952. California Pizza Kitchen (CPK) Crispy Thin Crust White©, UPC 71921 98745; production codes are 3062525951, 3062525952 and 3063525951. 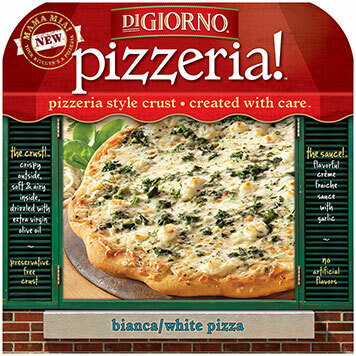 DiGiorno© pizzeria!™ Bianca/White Pizza, UPC 71921 91484; production code is 3068525951. All four of the pizza varieties being recalled were produced between February 26 and March 9 and shipped to retail establishments nationwide. It’s believed that the source of the unwanted toppings was related to the lot of spinach used in the production of this pizza and the three others involved in the recall. The company knows of one consumer who chipped a tooth because of the plastic fragments. Consumers with questions about the recall should contact Nestlé USA Consumer Services at 800-456-4394 or nestlepizza@casupport.com for further instructions. Hours of operation are Monday through Friday, from 8 a.m. to 8 p.m., E.T. and this Saturday, May 4 from Noon to 8 p.m. E.T.